They say that great minds and great experiences can ignite ideas together. They influence change in the society, environment and economy. Known as change makers, path breakers and ground shakers these exceptional individuals harness an insatiable appetite to develop, change and create meaningful action. They emerge from different walks of life but are cut from the same cloth. Life is there to be lived and when done right – it’s simply a buzz. The Queen’s Young Leaders programme is designed to discover, celebrate and support exceptional youth from across the commonwealth. Each year a handful of youth who have made a lasting impact on the community and beyond by using their skills to transform lives are chosen to be felicitated by Queen Elizabeth II. Rakitha Malewana was among the few who received the Queen’s Award this year. The 21 year old is an old boy of Nalanda College, Colombo, who is currently studying for the undergraduate degree at American National College. “I am working on two major fields at the moment. The first component is conducting researches. My basic research work is primarily based on medical and molecular biology with the special interest of oncology and microbiology. Designing and synthesizing novel drug candidates to treat deadly diseases has become one of my sole happiness and passions. My childhood was surrounded by various disastrous backgrounds such as seeing people dying because of terrorism and people dying due to various health issues. Therefore, what inculcated in me was find out a profession that I can truly help mankind to enrich my community with peace,” Rakitha explained. Venturing into social service activities, Rakitha has touched many lives with the volunteer activities he conducts on behalf of disadvantaged communities. This, he notes, is the second most fascinating component in his life. “I advocate people: specially marginalized community by networking advocacy programmes on sexual and reproductive health issues with the special focus on HIV/AIDS. The background reason to start working in this field was my voluntary teaching experience for the children of HIV/AIDS positive individuals who live around Colombo slum areas. The journey to those places candidly changed my life. There, stigma and discrimination to a HIV positive individual are sky-scraping. Seeing the brutal reality of the pain of HIV individuals is the major motivation factor for me to continue my work on behalf of the HIV positive community,” he said adding that his acts of lighting up the lives of the distressed and the needy, empowering them to come to terms with their issues and accepting them for who they are is what he enjoys most about his work. He notes that developing the nano-vaccine for HIV was a milestone in his work since it is a timely needed advancement which benefits HIV positive individuals. This discovery won him a gold medal at the International Science Projects Olympiad (ISPrO) 2015 held in Jakarta, Indonesia. He has also won a gold medal and the first prize for the research titled ‘A Low Cost and Eco Friendly Method to Cure Cancer: anticancer effect of Catechin coated Iron Oxide Nano particles on Leukemic cells by using Waste Iron’ at International Environment and Sustainability Project Olympiad (INESPO) 2015 held in Amsterdam, the Netherlands. 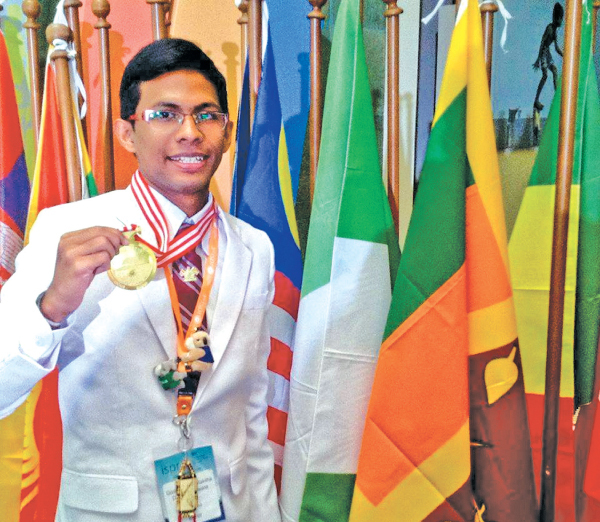 Rakitha’s research titled ‘Using Nano Technology as an Anticancer Agent: anticancer effect of Catechin coated Iron Oxide Nano particles on Leukemic Monocytes’ clinched a bronze medal at the International Science Projects Olympiad (ISPrO) 2014 held in Jakarta, Indonesia. The project also got him to the finals of the Intel International Science and Engineering Fair (Intel ISEF) 2014 held in Los Angeles, California, USA. His project titled ‘Effect of Young jack fruit extract (Artocarpus heterophyllus) and Cinnamon bark (Cinnamomum verum) extract to increase platelet count in wistar rats’ got him through to the finals at the Intel International Science and Engineering Fair (Intel ISEF) 2013 held in Phoenix, Arizona, USA. He was nominated as a global finalist at Ferias CT+1 International Young Scientist Fair 2014 held in Medellin, Colombia, and at the Taiwan International Science Fair 2014 held in Taipei, Taiwan. Rakitha has represented Sri Lanka at London International Youth Science Forum (LIYSF) 2015 held in London, UK. He took part in the event due to a special invitation handed out by the Prime Minister of UK. He was listed in the Forbes 30 Under 30 Asia - Class of 2017 in the healthcare and science sector and named as one of the youngest honorees from all categories. This event recognises Asia’s brightest young entrepreneurs, innovators and game changers. He is a Leader of Tomorrow awardee, a global gathering of individuals who have excelled in academia and business, organized by the International Students’ Committee from University of St. Gallen, Switzerland. Rakitha’s father, Anura Malewana, is an Education Director while his mother, Upeksha Abeysekara , is a teacher at Nalanda College, Colombo. His brother, Akila Malewana, is a final year undergraduate at UOC. Queried on the challenges he has faced while engaging in his work Rakitha notes that the lack of resources, facilities and the conventional mind sets of the Sri Lankan people are some of the barriers he had to break through in bringing about awareness and change through his work. He says that there is a lack of opportunities for youth to develop their skills. “As youth, it is our duty to work hard by taking the lead in the society to lay a sincere platform by overcoming challenges on behalf of other existing lives to make our community a better place,” Rakitha opined. Rakitha is also a co-founder and youth convener at United Youth Consortium (UNYCom), a community based organization which is working on behalf of the rights of HIV/AIDS positive individuals. “UNYCom is currently conducting many projects based on a vast scope. It is really hard to work on topics like Sexual and Reproductive Health (SRH) in schools/society due to the traditional culture and system of Sri Lanka. “However, we are trying to establish a positive culture where people can discuss their opinions about SRH with no hesitation in the society. Moreover, I am providing counseling sessions to HIV positive individuals to free their minds from anxiety and social depression. To date I have personally conducted more than 500 counseling sessions and the outcome and feedback is truly overwhelming,” he said. Apart from UNYCom Rakitha is also working on ideanerd SL, for which he is the founder. It is a community based organization for popularization of scientific research among school students in Sri Lanka. “Sri Lanka is a developing country and because of its lack of higher education opportunities, the competition for the local higher education is mounting. As a result of this students are not involving in any extra-curricular activity in their high school life. They are reluctance to innovate or solve the problems that the country is facing. In such situations, as the first Sri Lankan student to get the permission to do a biomedical research with the approval of the Government, I really needed to establish a culture for high school students to motivate them to conduct scientific researche. The result is ideanerd Sri Lanka which reflects that adopting innovation in education can help build creativity and better abilities to solve problems. By Promoting research and innovation among the school students in Sri Lanka and to give special attention to the rural areas, initiating, facilitating and supporting basic and applied scientific research including the research in social sciences to establish a sustainable and viable research culture for the greater benefit of the country, we motivate, inspire and uplift students to get an international exposure. The ideanerd SL initiative for research and innovation in science has been nurturing the real spirit of innovation among school students in Sri Lanka since 2012,” Rakitha said. The gifted youth wishes to complete his undergraduate degree and continue focusing on medical research. He is working on expanding ideanerd Sri Lanka to establish a common platform and inspire young researchers to conduct medical research and innovations in the future. We all must praise appreciate tea lent intelligence hardworking. Lanka cannot be a developed nation as it has no direction in that respect. Young old with talents must work apply their knowledge with the hope someone will identify support encourage them. All must come during early stages to focus on any project. Parents family must encourage as much as they can.